CHA - I'm Coming At-Cha! The Chatham-Kent Big Brothers Big Sisters Wedding Show took place this past Saturday and I had a fabulous day. I met some wonderful couples with the most unique ideas. Stationery is not what it once was......and I couldn't be happier. Remember going to a book and having to choose the invitation that best suited you? This is what I did 14 years ago. I remember settling on a design with no ability to make changes. Today is just the opposite. Any design that you can image, can be brought to life. Nothing brings me more satisfaction than hearing my couples say, "We love it." 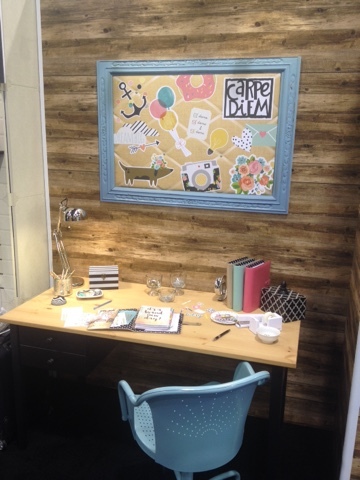 Here is a little glimpse of my booth. I like my booth to reflect the feel of the store. What do you think? Remind you of 44 Fourth Street? Next time though, remind me to pack a little lighter! That was a lot of moving for one girl. But it was all worth it. I was very proud of how it came together. 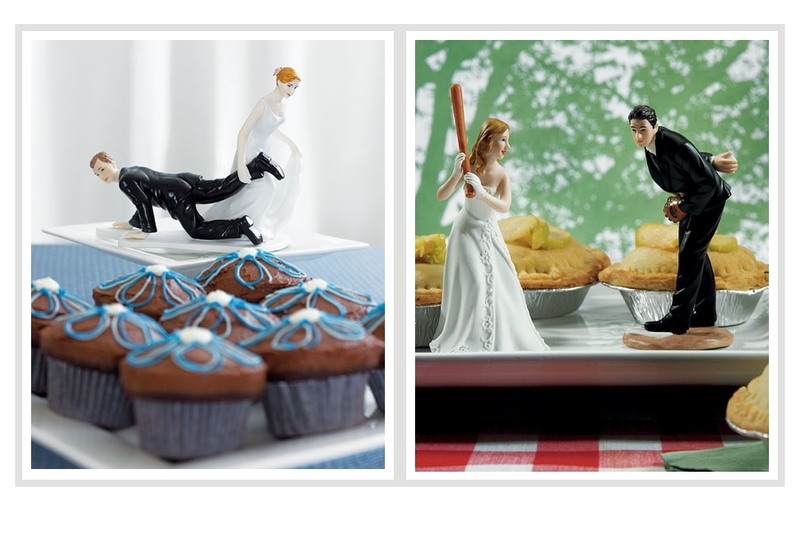 I also wanted to show that you can get crafty on your big day. I thought the chicken wire wall hanging I designed would make a fabulous gift. This along with a little note to your future hubby? What a special present. 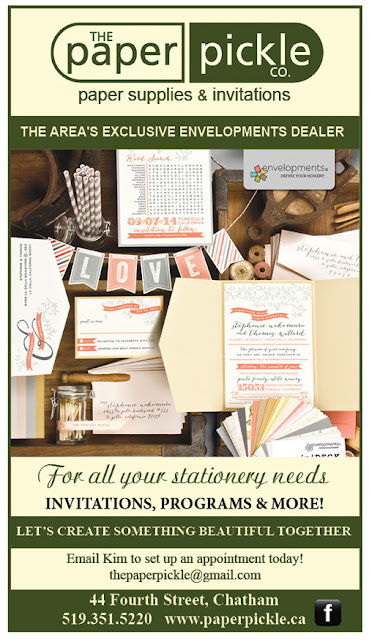 Of course my stationery designs were the main focus of the booth. I brought along my album which showcased many of my creations over the years. The one above was for my second cousin once removed. He and his bride love hunting and the outdoors. This design set the tone for their rustic outdoor wedding. I adore this design. Another focus of my booth was the incredible offering of wedding accessories offered through Weddingstar. Their product is stunning. And 13% off all orders placed through The Pickle? How can one NOT smile. For those of you who stopped by Saturday...thank you. I hope we can work together and I can help bring your visions to life. Happy planning. I'm very excited for today's show. Bradley Convention Centre. Richmond Street, Chatham. 11-6. Stop in and say hi! PS...The store IS open today. Jen will be happy to help you with your sweet/paper needs. As you know, I kind of have a thing for paper. My obsession dates back to when I received my first calligraphy set from my mom and dad when I was in grade 5. I had so much fun practicing my letters in every colour of ink imaginable. Today, my love includes designing greeting card, scrapbooking AND creating custom invitations and stationery. 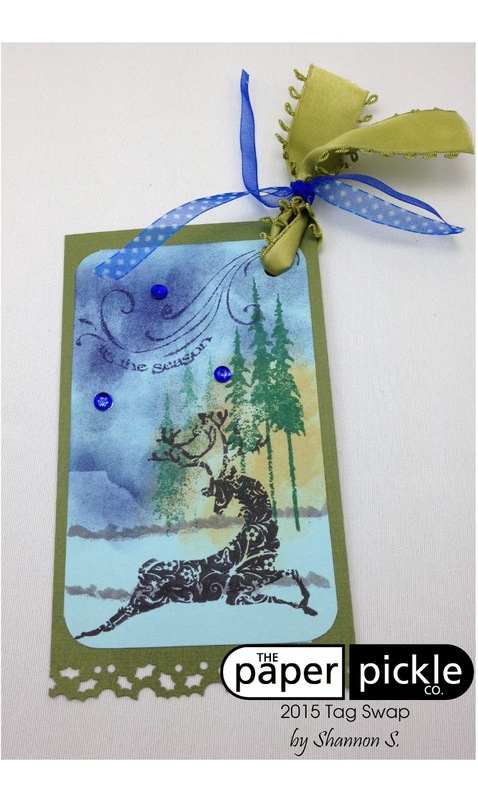 Given my background as a card maker, I am able to incorporate elements of the hobby to my designs. 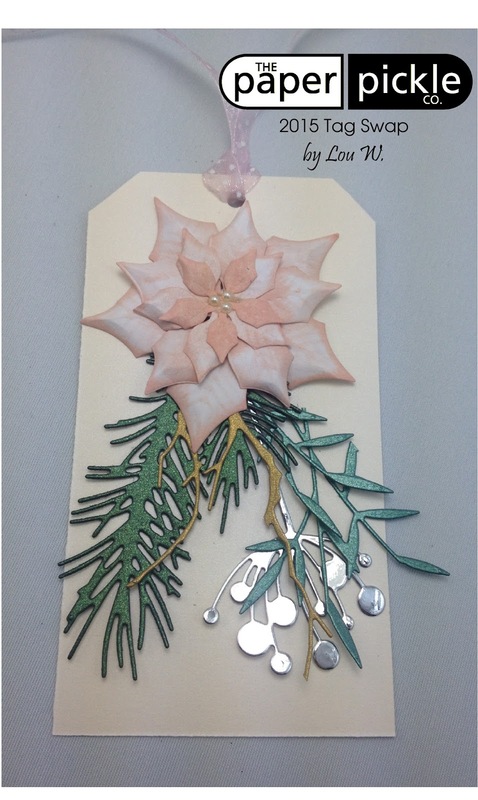 I have worked with embossing folders, embossing powder, wood embellishments, various papers including real wood (awesome, I know! ), glitter, foil, stamps and more. If you know someone getting married, tell them about The Paper Pickle. With invitations starting at $2.00 per set, I am able to meet the needs of any budget. 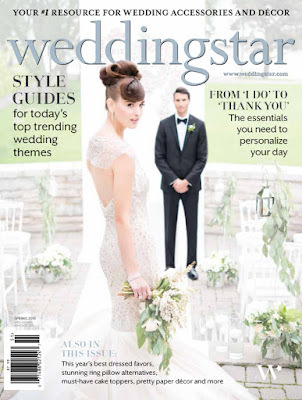 I have been working with Weddingstar since 2007. They really are THE wedding accessory people. I am continually amazed with their ever expanding offerings. 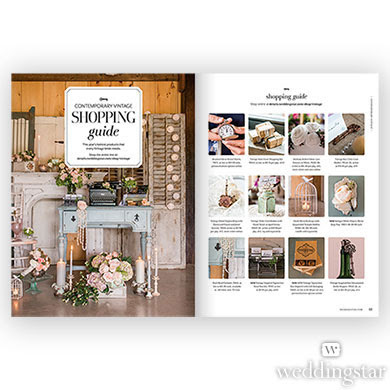 Weddingstar offers traditional items like guest books, ring pillows and champagne flutes in various styles. You can also find incredible non traditional and fun items including bubble gum favour dispensers, cake toppers of couples enjoying various sporting activities etc. Here is an example of their magazine/catalogue pages. but dream of ways to include these items in your next event. 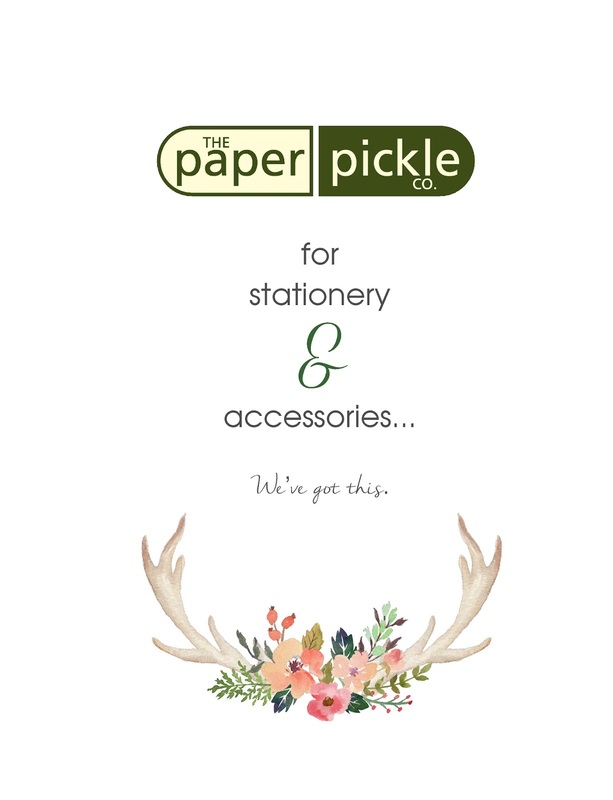 We offer 13% off all orders placed through The Paper Pickle. Shop online and email me your wish list! 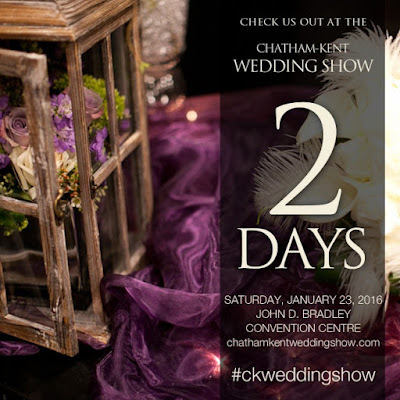 The Chatham-Kent Wedding Show is THIS Saturday and The Paper Pickle will be there. Stop by The John D. Bradley Convention Centre between 11-6 and see samples of real invitation that I designed along with my incredible couples. That's right....at The Paper Pickle, I like my couples to help with the design process. 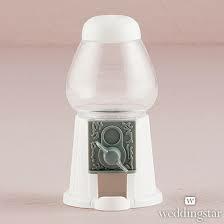 I will also be featuring beautiful product from Weddingstar and you can see the wonderful quality for yourself. Hope to see you Saturday! If you do not get a chance to visit the show, please email me and I would be happy to set up an appointment for you. 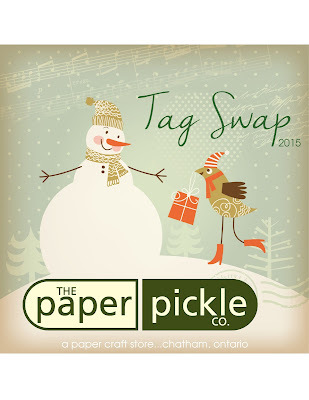 PS....For all you paper crafters out there, I am coming at you over the next few weeks! 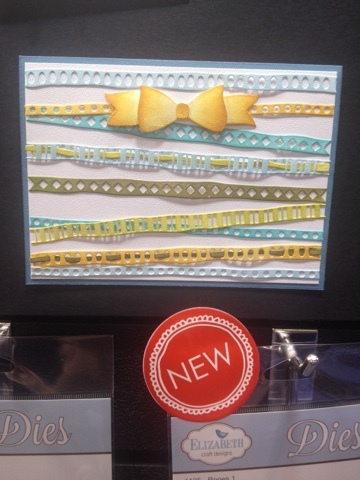 I am eager to get creating new samples and class offerings. CHA has me charged up. Two posts in one day! This may be a record for me. I didn't want you to miss this great class offered by Debbie. Two cards filled with wonderful technique! 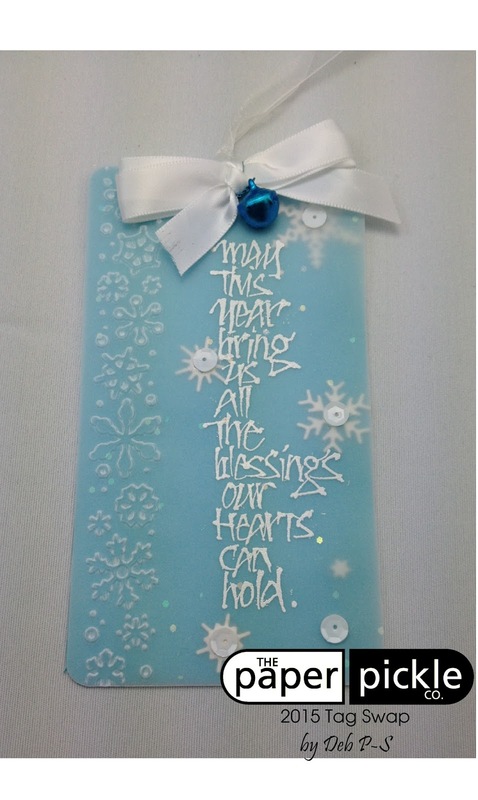 These cards are perfect for any occasion including Valentine's Day, anniversary, sympathy, etc. 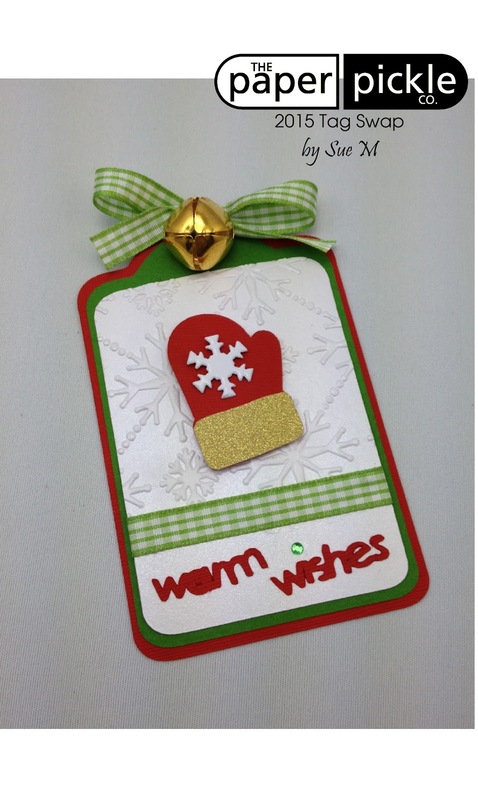 Work with dies, embossing folders, embossing paste, Inka gold and more. Cost: $17 which includes all supplies and a sweet treat from Homebaked Kitchen Co.
You can call the store (519-351-5220) or stop in to register. If there is enough interest, we may run a second evening class later in February. Please let me know if you are interested in this option. Run, Kim, Run. Truly. I feel like my trip to California allowed me to do it all.....to see it all, just like Forrest. It was without a question, the best trip I have ever been on. California has a very special place in my heart ♥. and we spent two beautiful days there. and enjoying the sand between our toes. I might mention that we visited Santa Monica and Hollywood on Sunday January 10th. and tv trucks at the Beverly Hilton. We were driving by at 3pm....2 hours before the Golden Globes were set to begin! Lots and lots of limos around but sadly I didn't see anyone....THIS time at least. So Disney California has two parks: Disneyland and California Adventure. I love Disneyland but I especially love California Adventure. Paradise Pier has an old fashion flair. I love the fair or carnival type setting. You can see we felt at ease here. We had a blast! 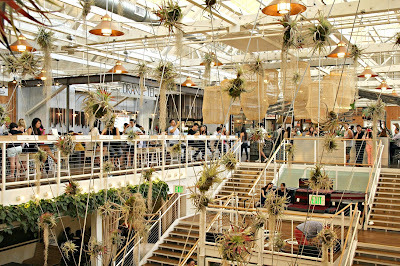 On my list was visiting the Anaheim Packing House. and has been converted to the most unique dining experience. 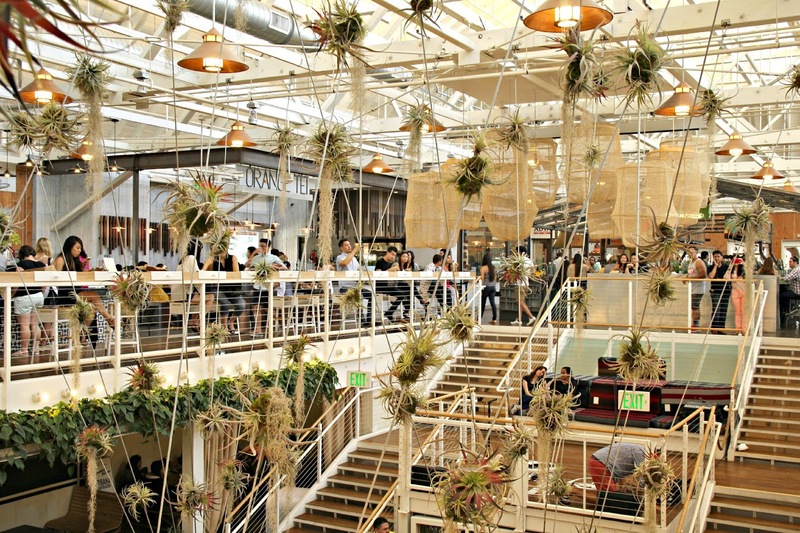 With over 2 dozen fabulous artisan eateries, there is something for everyone. We had some pretty serious poutine, crepes and build your own gelato pops. the true art that goes into the creations. Even found a bike at the Packing House. This sealed the deal for me. I will love The Packing House FOREVER. 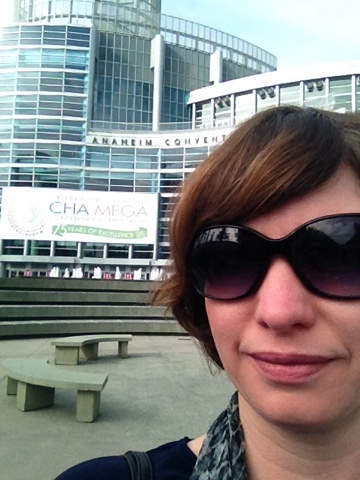 Since this was the last year (after a 10 year stint) CHA was calling The Anaheim Convention Centre home, I HAD to experience it first hand. And it was as wonderful as ever. The amount of effort that goes into the booths and the samples is mind boggling. The best of the best is there to represent themselves and it definitely showed. I was wowed at every turn. You saw a few of my pics from previous posts, but here are a few more. 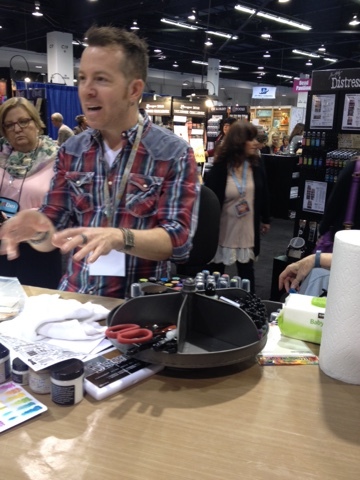 Of course I was drawn to the rubber stamp booths and samples. I wish these cards showed up better but are these not incredible? 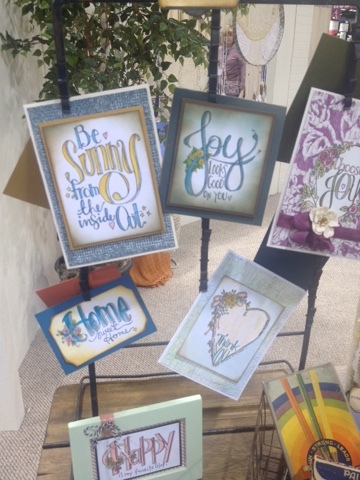 Penny Black watercolour-style cards above were so elegant and dreamy. You can always count on a good laugh at Art Impression's booth. This is an oldie (no offence!) but certainly a goodie. 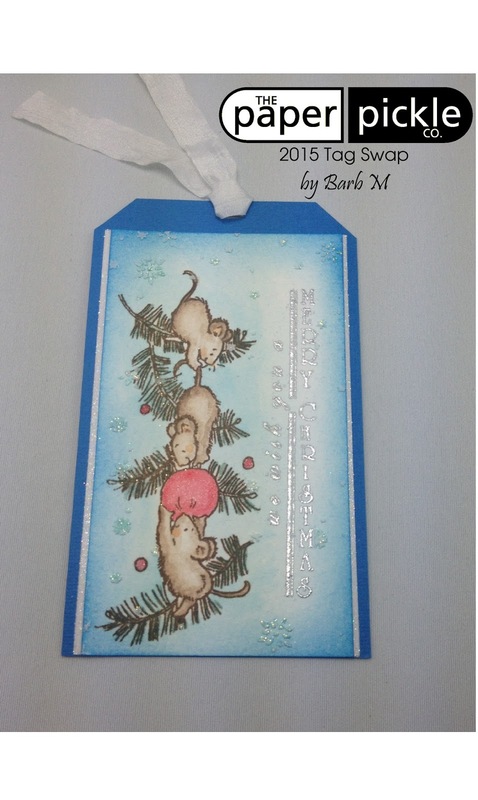 Spellbinder's now has rubber stamps thanks to the wonderful partnership with various artist. Above is a gorgeous stamp by Tammy Tutterow. This makes me smile. Anyone interested in getting a special guest artist to The Pickle? Tammy is at the top of my list. Planners were all the rage at the show. I know some of you are not sold on this concept but I hope to show you how much fun you can have with these!! (Ahem.....I may be putting a call out to all my planner frenzy friends to help me out here!). So, so FUN. Carpe Diem? Of course I will!! You feel like a kid in California! I think my smile with Pluto says it all. I am recharged and ready to rock and roll this year! I adore how natural Jules looks here. California is one of her happy places. It was amazing how Coulter was all business at the beach. He would not rest until his fort was complete. So yep....those are surfers in the background. Cool....dude. So don't think this trip was ALL play. 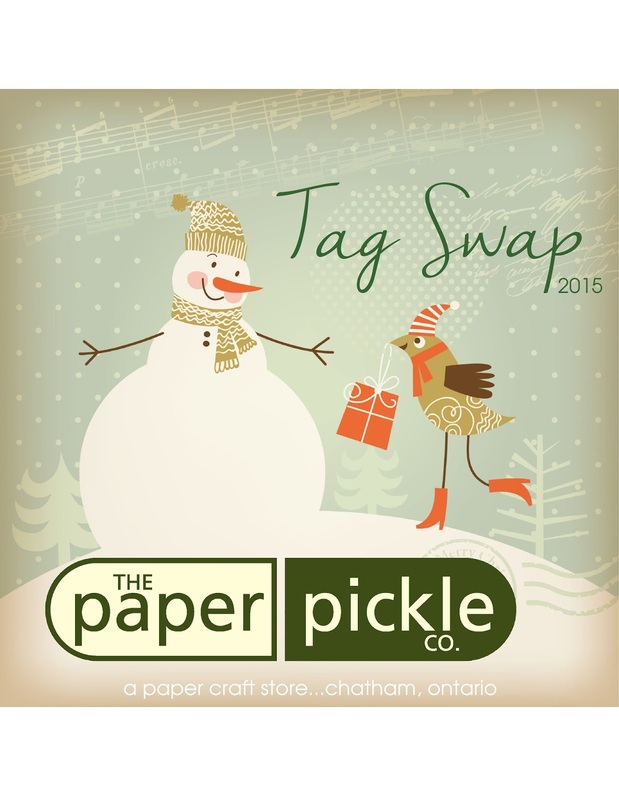 I represented The Paper Pickle very well, I think, playing it very cool at the booths. No fan photo or autograph requests from this girl. I was very professional (hey, I got lots of photos from past shows...haha) and took tons of notes. Products have been ordered and I cannot wait to share my love of the hobby with you again this year!! CHA. It never gets old. I am in awe at each and every booth. Brilliant artist. Incredible product. 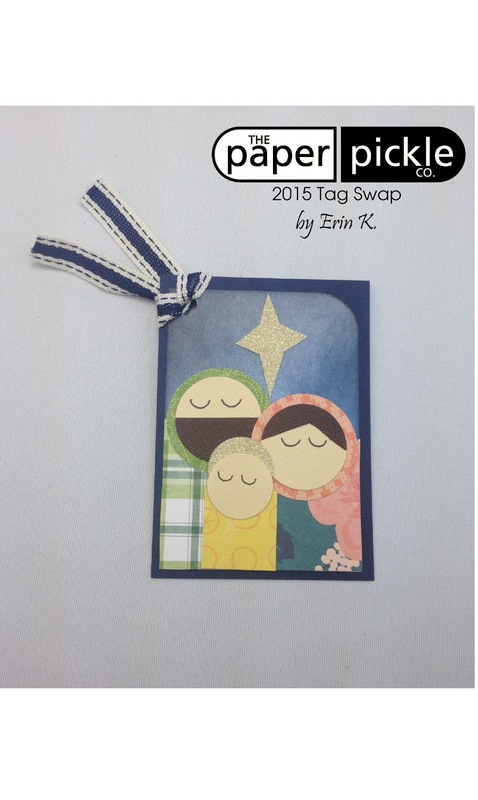 It is the perfect storm to get this paper lover enthused...inspired....ready to create! 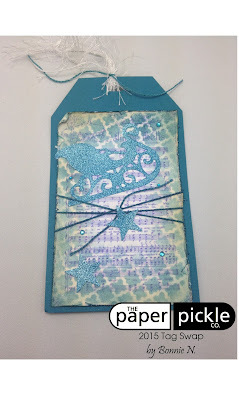 Spellbinders released stamps by Tammy Tutterow. Her designs make me smile. 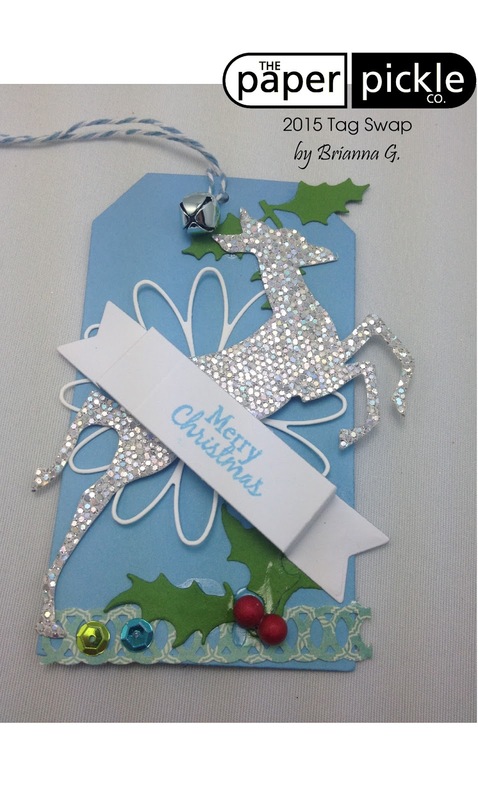 You should also see the fabulous dies and embossing folders! This booth was SO inspiring. Planners by Simple Stories. The entire line called Carpe Diem is incredible. The quality of these planners plus the fact that they are blank and ready to be self dated make them my favourite planner of the show. These dies by Elizabeth Craft Designs WILL be at The Pickle. I am in love. So versatile and unlike anything I have ever seen. 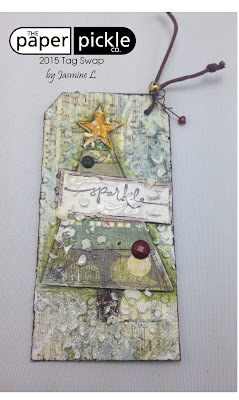 Everything Tim Holtz. Can you say Distress Crayons, Distress Glaze and Metal Storage Tins for your Markers? I took three pages of notes as I watched the master in action. This is just a little taste of my favourites. I promise to share more! 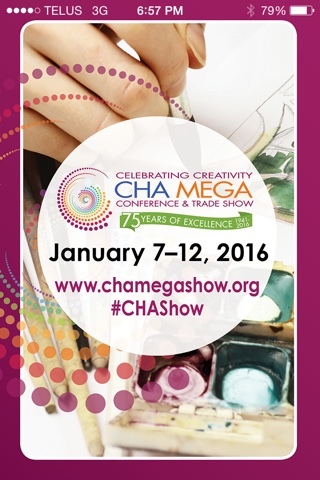 I'm off to the show tomorrow to finish up my hunt for the best products to bring back to you! You guys. You guys. I'm on my way. On my way to CHA! I promise to report on the latest and greatest. I promise to watch the paper geniuses in action and bring back some incredible techniques and new goodies for you. I'm heading to the show early new week so please email me with requests and items to check out. 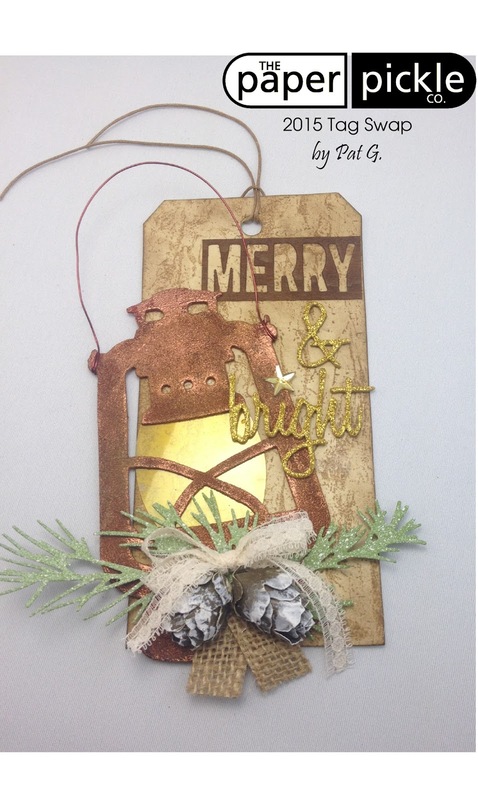 I thought it would be fun to ring in 2016 with a little creative inspiration. 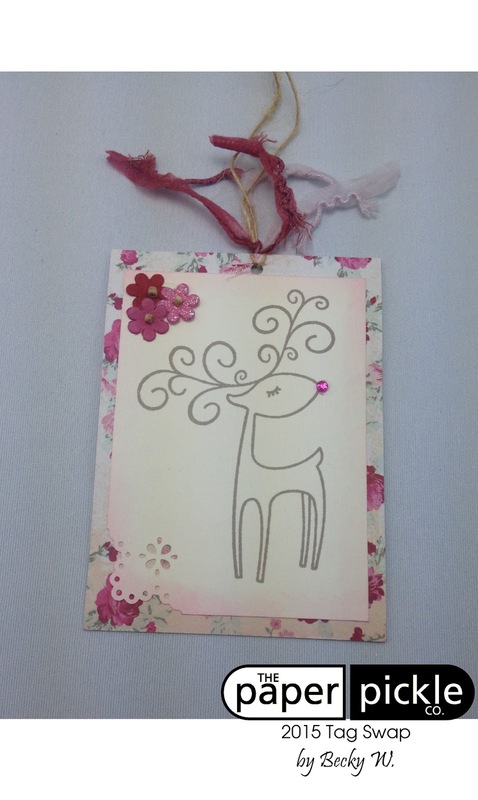 No need to search the web/world for creativeness....your neighbours and fellow crafters have got it going on! 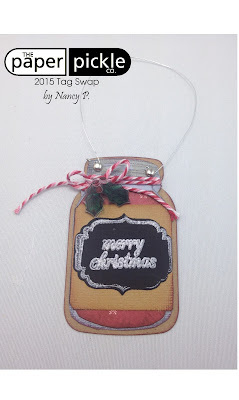 As you know we had our third annual Christmas tag swap. We had two full groups (24 in total). You may remember that I put a little plea out there to help fill the remaining spots. There was such support, that I got bumped from the exchange! I am bummed that I do not get any of these lovely creations for my collection. I did however borrow my sister's light box to capture some wonderful shots. I would have loved to showed all the close up detail shots I took but this blog would have taken me days to post! Ha. Do your best to zoom in to see all the details. I was blown away with the amount of thought and detail put into each and every submission. 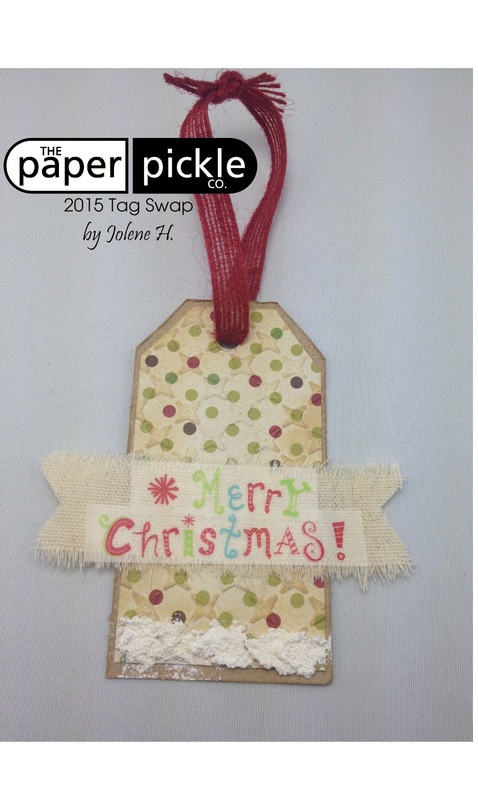 Without further ado, I give you The Pickle's 2015 Christmas tags created by YOU and your friends! makes this one of my favourites. embossing and glitter are incredible. Becky's tag made me smile. I was delighted to see her choice of background papers. This is non-Christmas paper from MME but it has always been at the top of my list. Also the little knock out punch, flowers and twine are the perfect embellishments. 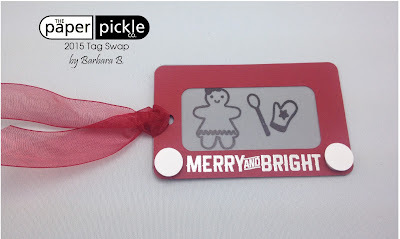 Barbara's Etch-a-Sketch inspired tag is ADORABLE! She even popped up the circle controller knobs. 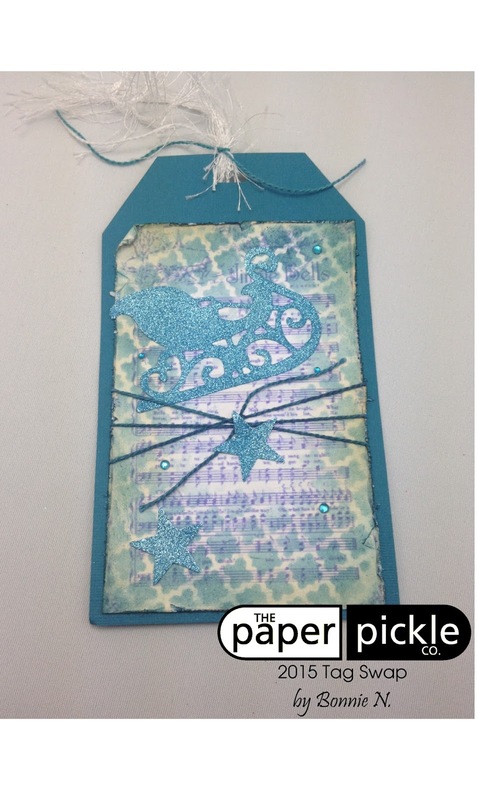 And A+ for using Hero Art new stamp set called Homebaked. Elegant meets distress. Bonnie has won my heart! I love the fibrous twine, glittered sled and use of stencils. The star and rhinestone accents are very clever. You must know that Brianna is 8 years old. I opened Carol's bag of tags. They were so fresh. So clean. 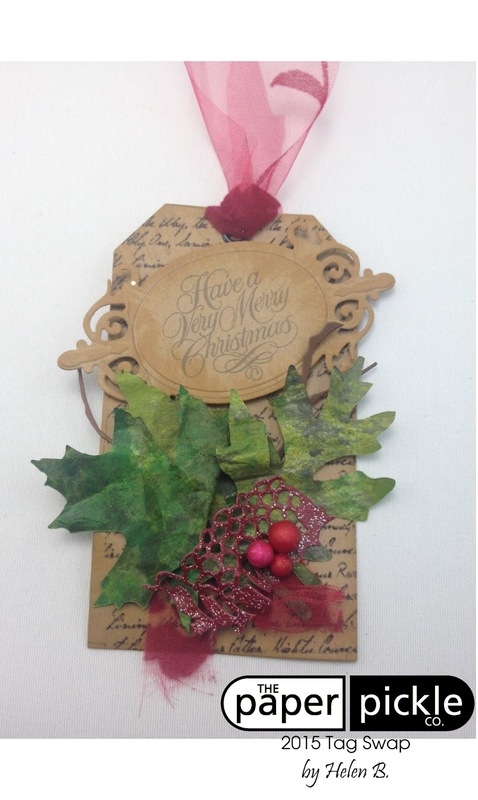 vintage twine and dimensional wreath. Debbie's tags are so elegant. and heat embossed in white on the right. 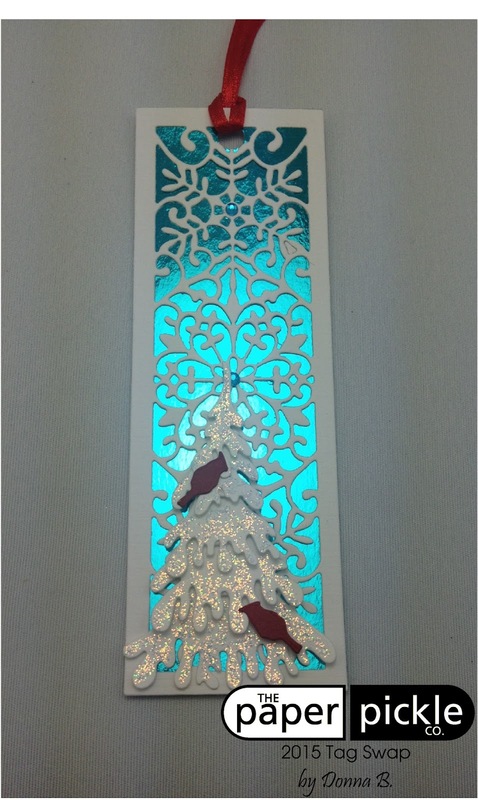 There are incredible snowflakes with rhinestones on the blue cardstock backer. The little jingle bell is a very nice touch. for the elegant snowflake background die and tree. and anyone who received this would have to hang this on their tree! I loved her use of shimmer spray on the entire tag. It really shined! Erin has done a wonderful job with her tag. It is so creative! and beautiful papers to create a masterpiece. and that is what I love about her designs! that were highlighted with embossing powder. Hilary's daughter, Sally is also in this swap! Helen is apart of my three generations of entries. 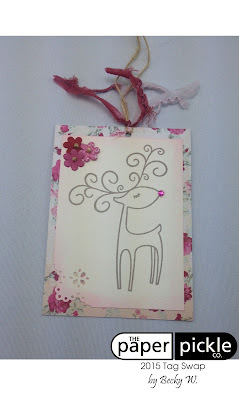 This tag is so regal and is so appealing to the eye. The light tissue paper weight leaves were incredible. There is something about ginger bread men that make you smile. Holly has design such a sweet tag. Merry Christmas tag are wonderful. 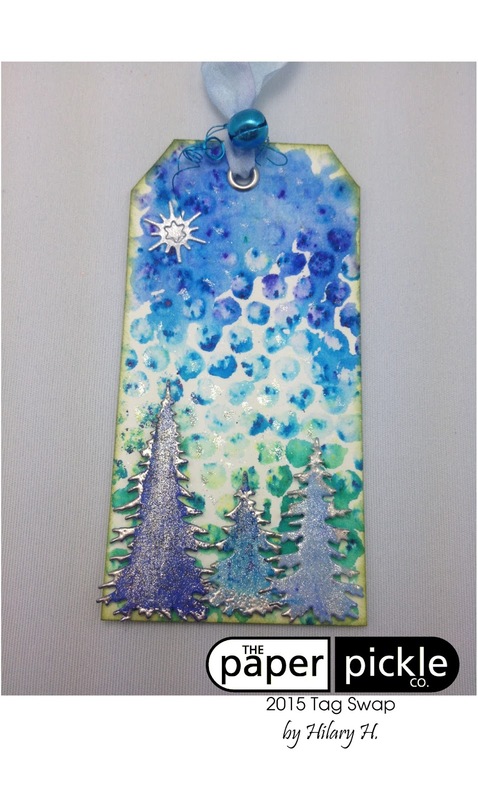 Jasmine's tag is a mini mixed media masterpiece. I will have to ask her where she found those rhinestones and mini beads! Jasmine is apart of another mother/daughter entry. 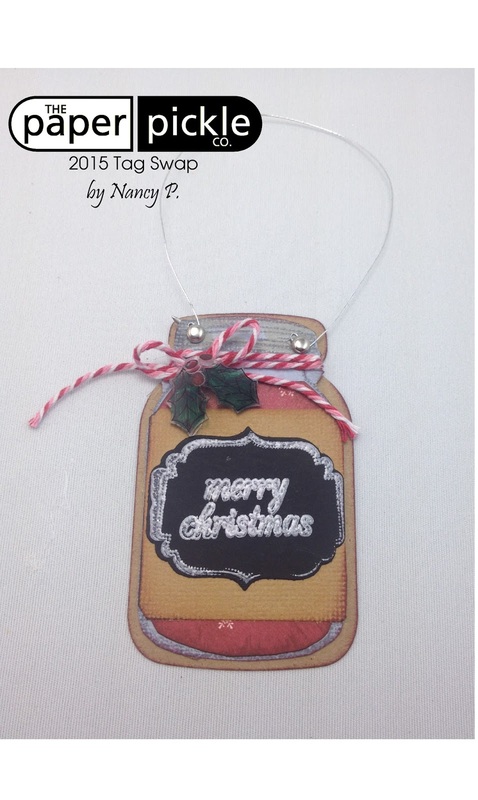 Her mom is Nancy P (the mason jar tag to follow). It is very had to capture here in a photo but Jody's tag is awesome! 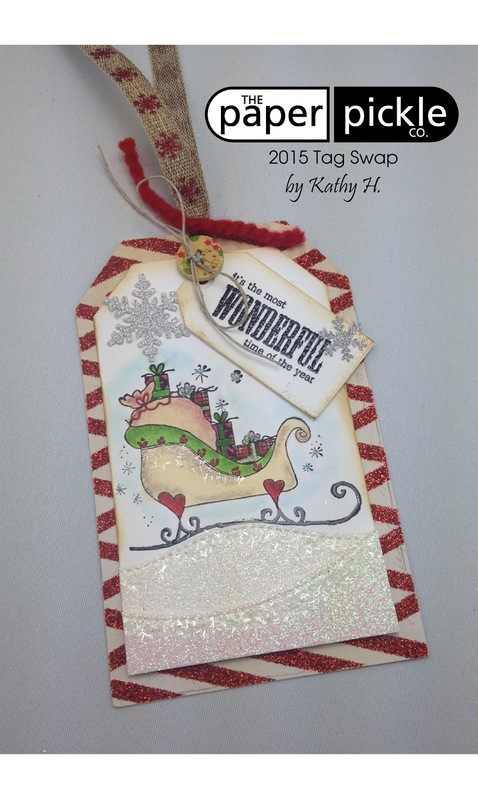 It is a shaker tag bursting with shine and elegance. 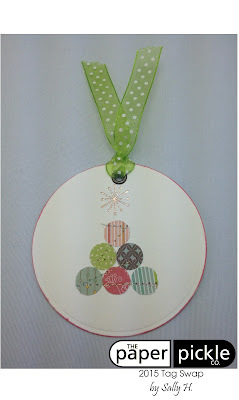 I love the pearl at the top of the tree and subtle washi tape on the bottom. 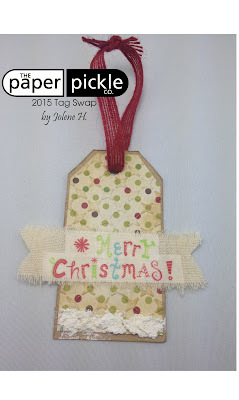 Jolene's tag is so crafty and FUN! background paper and burlap ribbon. Let me introduce you to Karrie. She is Brianna's mom and Helen's daughter. Is this tag not adorable?! 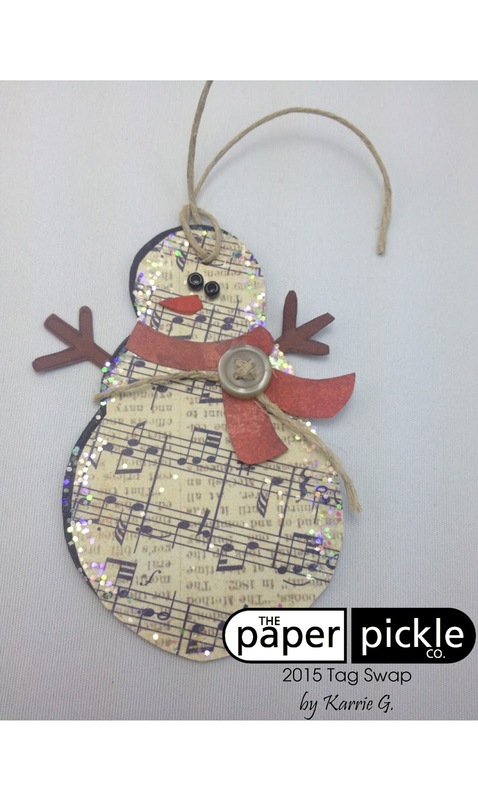 Her use of vintage style sheet music paper is very creative. 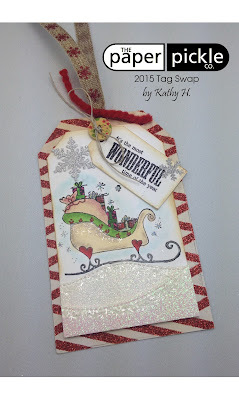 There is so much detail of Kathy's tag! This is something I have noticed on all her creations and it is wonderful. beautiful button and fun trimmings. Stunning. 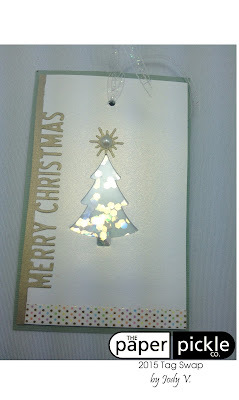 Christmas dies and a few every day dies to create a soft shimmery tag. Another tag that must been seen in person to be truly appreciated. And now Jasmine's mom Nancy's tag! 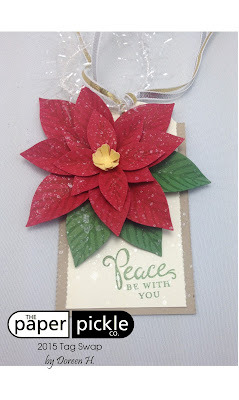 even used heat shrink to add her berries and holly. It too could be a perfect ornament on a tree! Tim H. himself would be impressed with Pat's use of his product. Again there is so much dimension and detail here. A little masculine and 100% classic. definitely busy punching and stitching. Simple and clever. ...always the perfect combination. 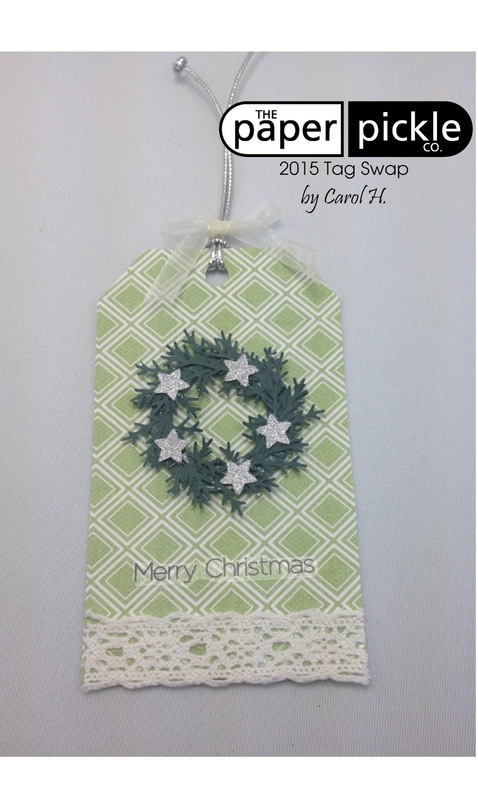 One look at Sue's tag and you can't help but smile. Shannon is another girl who is not afraid to get her fingers inky! Check out her stunning background techniques. So many of these stamps bring back wonderful memories. I love the bottom holly punched edge. Wowed? I told you so! My customers have always inspired me and given me such wonderful ideas and tips over the years. Thank you for that! Pat G! This was a random draw and you can thank my son for choosing you as the winner! Your winnings will be ready for pick up during store hours. Hopefully this post gives you that little spark you need to get creating! Happy New Year!! PS.....We will closed tomorrow (Jan 2) but resuming regular store hours next week. Wednesday-Friday 10-5 and Saturday 10-3.